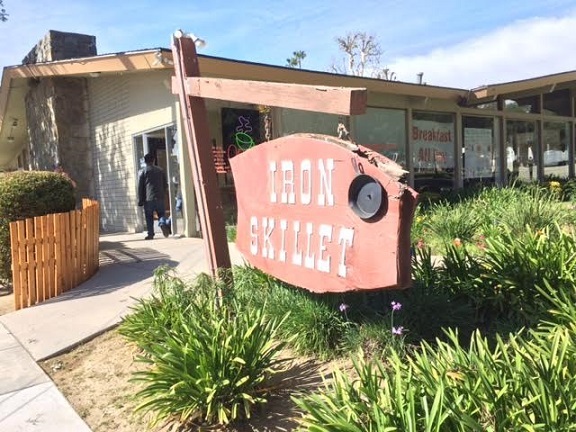 Iron Skillet, 805 N. Euclid Ave. (at H), Ontario; open daily, 6:30 a.m. to 8 p.m.
One of Ontario’s most distinctive restaurants, the Iron Skillet dates to 1959 and was built in the Googie style, with a low-pitched roofline and expansive windows, not to mention an old-fashioned counter with swivel seats. 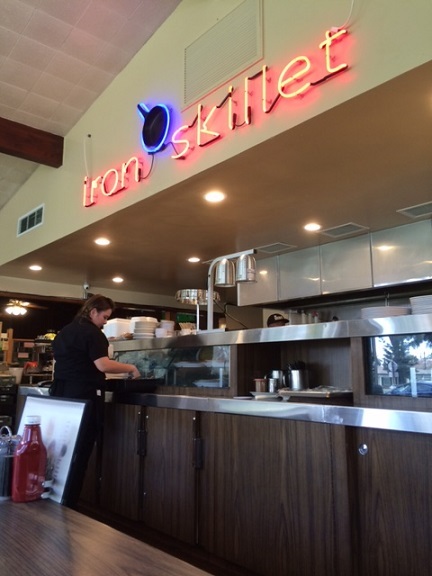 Originally a Spires Squires, it’s been Iron Skillet, under various hands, since about 1980. After a period in the doldrums, it’s perked up in recent months under new owner. A reader advised me to give it another try, touting the freshly baked bread, pies and home-cooked food. So, after a long period away, I’ve gone in a couple of times for lunch. First visit I got a special, the BBQ brisket sandwich ($9), which was a mistake. I forgot that kind of sandwich is basically chipped beef. The fries were better than average, though. Next time I got the half-sandwich special ($11, I think), which came with two sides, from among a choice of soup, salad or pie. I got a tuna melt plus a Caesar salad and apple pie. (There were three flavors available.) It shouldn’t surprise anyone that I got pie, or that I opted for my baseline diner sandwich. 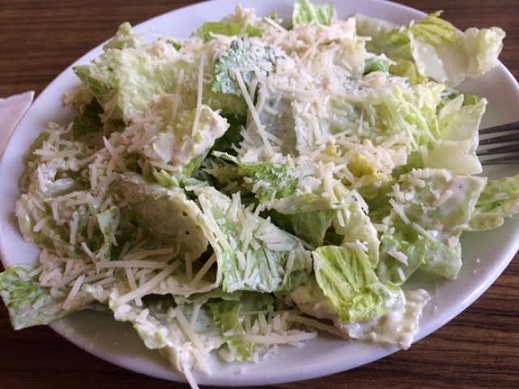 This was a filling meal, and pretty good too: big salad, hearty sandwich even in a half-portion and, after a few minutes for everything to settle, a slice of pie. 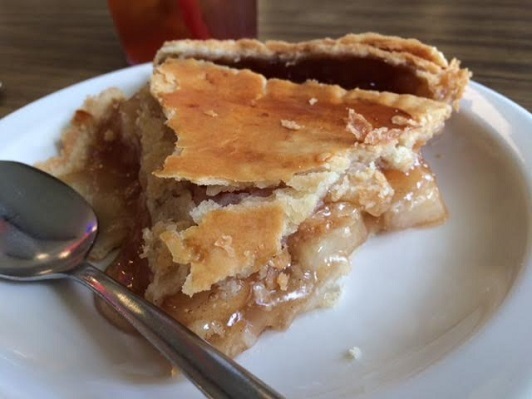 While the pie was along the lines of the type you get in a supermarket, i.e., not spectacular, it was pie in a diner, where the ambience improves the experience. I’m not sure why it was served with a spoon rather than a fork. Everything is homemade, including the pie and bread, my server told me. 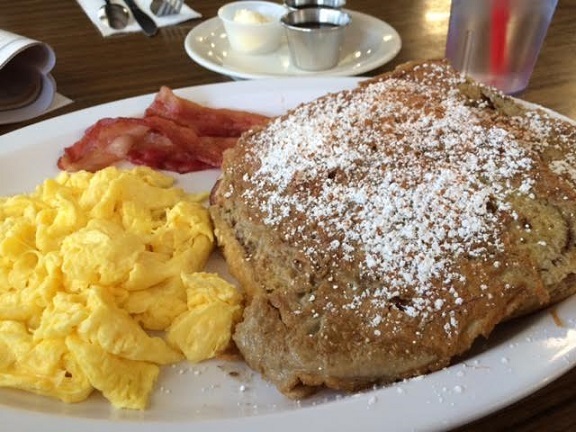 Breakfast is served all day, they’re open for dinner and, after 4:30 p.m., dinners come with ice cream on the house. Perhaps no other restaurant in Ontario can make that claim. 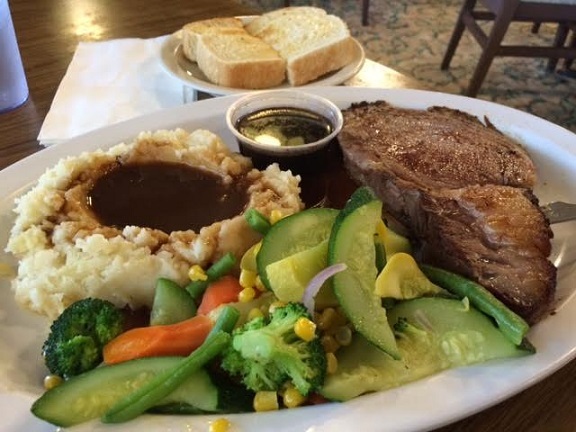 The menu has a variety of breakfast items, sandwiches and salads at lunch, and chicken, steak and seafood items for dinner (including, for those who find this appealing, liver and onions). Unexpected beverages include Italian sodas, Shirley Temple and Roy Rogers. 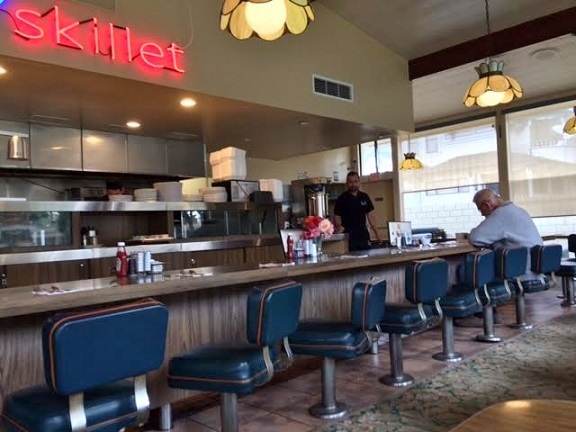 The Skillet is worth a fresh look if you like classic American diners. It’s nice to see them trying again. 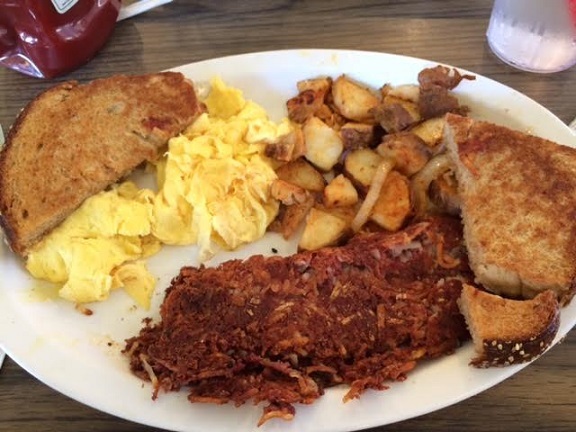 Update August 2016: I’ve gone back a few times, including twice for breakfast, getting the cinnamon french toast (oh, that home-baked bread) and hash and eggs, both superior. An early bird dinner (for me it was a late lunch) of prime rib wasn’t bad either, and if memory serves, around $10. And it came with ice cream. This entry was posted in Restaurants: Ontario and tagged American, Ontario, restaurants by David Allen. Bookmark the permalink. How fortuitous a visit. A friend and I had breakfast there recently and found the place spruced up and the food very good. We used to walk or bike there fairly regularly. I miss the real fireplace and remember a very warm dinner eaten near it some time back. Iron skillets are still a good way to cook. Ah, a working fireplace. I’ve never eaten in the dining room, I don’t think, just at the counter or the adjacent booths. 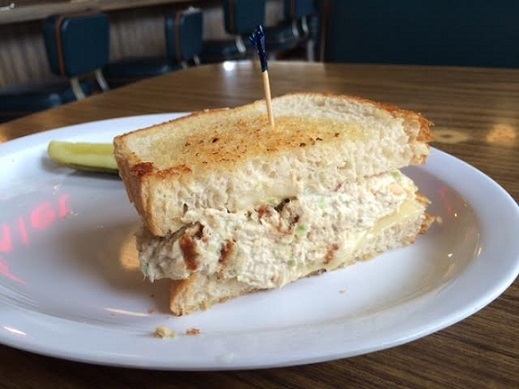 I suppose the “go-to” tuna melt wasn’t “column worthy”. 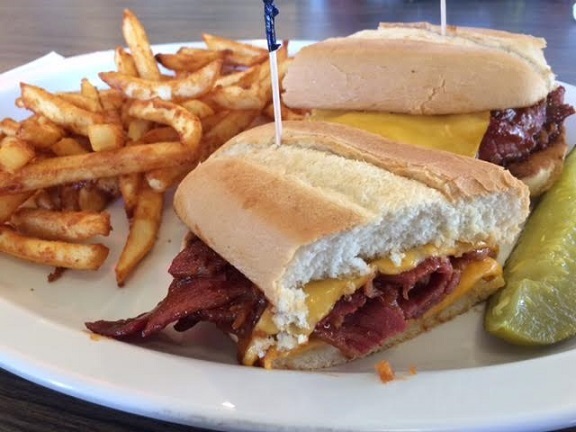 Hey, I said it was “pretty good,” and “hearty” even in half-sandwich form! I’ve had a few better, but lots worse. Sorry to come tardy to the party. I have to add a kindly correction to this post. This location was never a Spires; it was for many years Squires, a popular spot for Chaffey High School students, faculty and alumni. The only Ontario Spires is the one that still exists on the NE corner of Vineyard and Holt. Gracias for the correction. I knew that fact once but the similar names blurred in my mind. Correction made above.